My Standing Desk at fred’s, Inc. 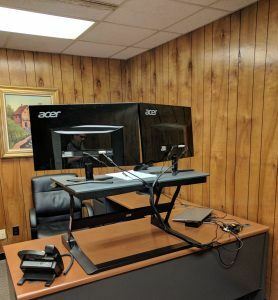 Despite being way behind the curve on this one, I wanted to jot down some first impressions after one week with a standing desk. At my last gig, they started distributing these out to those who requested them right before I joined. I requested one, but the second wave of desks never arrived before my departure. 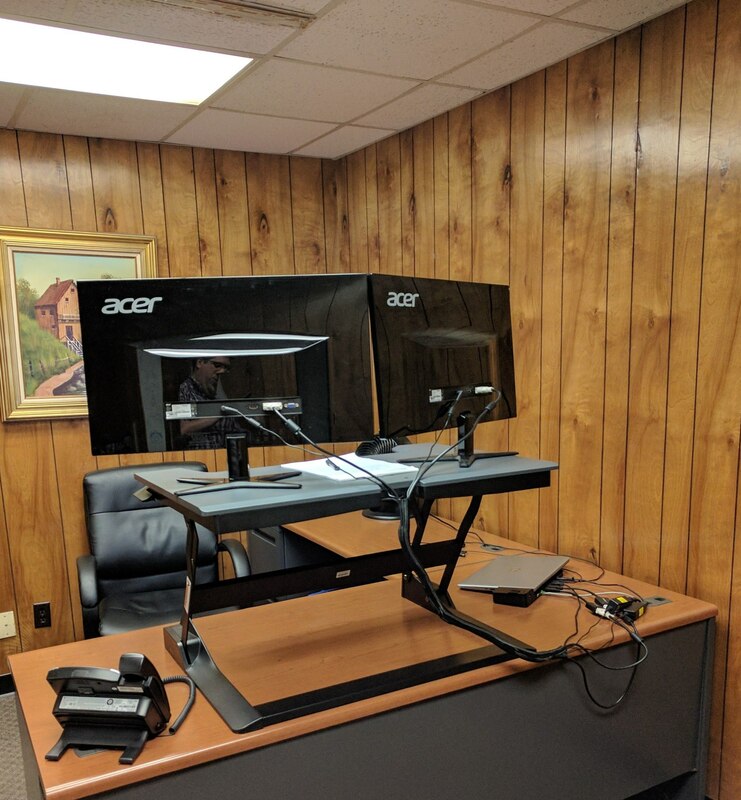 This Monday, my new boss rolled in the standing desk that I had requested. As I had observed colleagues use standing desks in the past, I always assumed that the friction of manually raising and lowering the surface would prevent me from frequently adjusting my posture. The model that I have, though, has a surprisingly good counterbalancing mechanism that makes adjusting the height super quick and easy. Over the course of the last four days, I have spent probably 50% of it standing. I can feel it, mostly on my heels. I ordered an anti-fatigue mat that I hope will help relieve some of that pressure. My goal was never to stand all day, but to change positions every hour or so. I hope that these two factors combined with building up endurance will make a habit of standing discomfort-free over time. Additionally, the standing position certainly improves my posture all around. In my back, sure, since it is not tempting to slide down in my chair. But, I guess I was also surprised at how the limited desk space in the elevated platform forces improvement in my typing form. The only physical contact I make with the desk while standing and typing are my fingertips. Stay away, carpal tunnel. My primary goal for trying one of these desks out was to fend off mental exhaustion and drowsiness that often sets in about mid-afternoon. Coffee can only do so much. It has only been a week, but I can say that it helps with that. Something about the standing posture contributes to sharpening my mental focus. I will have to wait and see if that is actually due to the new position, or if it is merely the newness. So far, I am pleased with the results.